By Cricel B. Elises, Administrative Assistant. 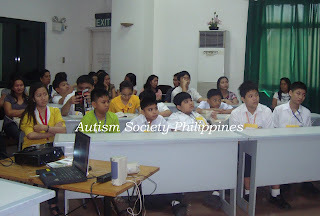 Apart from the objective of consciousness-raising on autism, Quiz A also serves as an opportunity for children with autism to exhibit their talents and participate in activities that will show the general public that they can be mainstreamed in the regular system with adequate and proper support. This year’s Quiz A was sponsored by the Council for the Welfare for Children, Buhay Party List, Committee on Social Services, the Philippine House of Representatives, Department of Education, NORFIL Foundation and ASP National Office. It was held at the Norfil Building, in Quezon City. 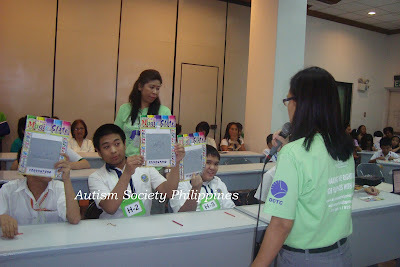 Our volunteer host was Ms. Hazel Borja and the Quiz Masters were Ms. Chit Singayan, Senior SpEd Specialist of Department of Education (DepEd) and Ms. Alpha Larga of Council for the Welfare for Children (CWC). Ms. Angela Marie Pangan, President of Norfil Foundation gave her welcome remarks. It was followed by the Opening Remarks of Ms. Chit Singayan. Commonwealth Elementary School, Lagro Elementary School, Barrio Obrero Elementary School, New Era University, Makati SpEd Center, Rizal Elementary School, Dizon Elementary School, Mind Matters Christian Academy, Ann Harbor Montessori, P. Gomez Elementary School, Alabang Elementary School, Eulogio Rodriguez Integrated School (ERIS), Torres High School, and Jose Fabella Memorial School were among the schools who joined the contest. The exciting contest became more exciting during the High School Category because all the five contestants were very good in answering all the questions. After 15 questions, 3 participants got the same scores so the quiz master gave tie breaking questions. The winners were pleased to receive a gold medal donated by Governor Vilma Santos-Recto of Batangas, tokens from the Committee of Social Services of the House of Representatives, and cash prizes from Congressman Irwin Tieng fo Buhay Party List. The Quiz A Winners for the Elementary Category are: Ainrand C. Navarro, First Place; and Carmelita P. Nazario, Kim Lawrenz Esperanza and Jericho M. Andrade, Second Placers. The Quiz A Winners for the High School Category Jona Victoria Balaguer, First Place; Irish Charles Eden Satorre, Second Place; and Rainier Vince Catabijan, Third Place. See you all in the 2013 for a bigger Quiz A!